What do the Ilhan Omar debacle, the Chabad Cabal Jewish Supremacy doctrine and the Antichrist have to do with each other? Watch to find out! 2018 was a pivotal year. The modern UN-created State of Israel – not to be confused with Biblical Israel – had declared for itself a Jubilee. In 2017, the non-authoritative, but religious body of the Chabad-created and run Sanhedrin, had declared its Jubilee. For two years, the Jews celebrated their first Jubilee in over 2,000 years. So, for two years, the Israeli Jewish nation celebrated a Jubilee with no intention of restoring YHVH’s Land, and all believers’ inheritance, back to all twelve tribes. Judaism teaches that all twelve tribes must convert to Judaism. They believe that all who are truly Israelites have already done that, so a call to all Jews to return to the Land is, to them, a call to all twelve tribes. Yet, the House of Israel exiles who are trapped in their various religions of Christianity, Islam, Buddhism, New Age, etc. still await their call to return because the House of Judah Jews of Judaism reject that we are their Hebrew brethren. They even reject the House of Judah descendants that are still trapped in Christianity, Islam and the other world religions. To Judaism, those who do not practice the religion do not have a part among their Jewish Hebrew brethren and will not have a part in the ‘world to come’ except as Noahide Gentiles and slaves of Jews. We shouldn’t complain. After all, Hebrew Roots believers – those who have come out of Christianity under the calling of the Ruach (Holy Spirit) – were once under the notion that unless Jews and Gentiles accepted Christian doctrine, they would be excluded from the coming Kingdom, too. Islam has its own ideas about the next life, too. YHVH’s people are caught and trapped in ideologies that are not theirs – worshiping gods they were never intended to, but which were prophesied to happen for their rebellion. So, here we are today stuck with the hatred that religions bring because YHVH’s people have rejected His righteous Kingdom with all its benefits from the beginning. You might think this has nothing to do with news. The fact is that it has everything to do with the news. That is the news that affects those looking for Yeshua’s return and the start of His righteous Kingdom and our becoming once again part of a holy nation. I have been explaining how Judaism and Islam are both vying for supremacy in the world, but the arguments are hottest in the head of the Westernized nations, America. You’ve heard about the recent rise of the Chabad Cabal right-wing supremacy-oriented Judaism in the Jewish State and the Jewish man who will be revealed by them as the one who will rule the world. This is messiah #1 which I have told you about in recent months who be the Jewish Antichrist. Indeed, it is the revealing of the Antichrists – yes, plural Antichrists – that is the topic of this section of BWN today. Let’s do a quick review of what we’ve learned about the Jewish Antichrist so far by watching this video from which I have taken excerpts regarding Jewish supremacy. What does the sudden rise of Jewish Supremacy have to do with the Jewish Antichrist? Won’t he want to be even-handed with all the people of the earth? The answer to the last question is ‘no’, he won’t want to be even handed and treat all people with equality and mercy. The reason for this answers the first question which is Jewish Supremacy. The coming Jewish messiah, who is Antichrist, will be a Chabad Cabal Jewish Supremacist of the ilk you just watched in the video. Now, let’s talk about Antichrist #2. The battleground of Antichrist #1 and #2 is forming on American soil. Let me explain. There is an ongoing 1400-year struggle of Islam for world dominance which is rearing its ugly head in the United States under the Ilhan Omar Antisemitism debacle. Let’s look at this video which expresses the Islamic agenda for America. I have been telling you for a long time about the Islamic messiah who will be the Islamic Antichrist. Now let’s put these two ideologies – that of the Chabad Cabal Judaism and Islam – together with the Ilhan Omar debacle. Ilhan Omar is, as you know, the replacement for outgoing Minnesota’s Rep. Keith Ellison (the first Muslim elected to Congress). Makes me wonder what’s gotten into Minnesotans. Let’s remember how many Muslim refugees have been settled there over recent decades. Clearly, these Muslims are voting in large numbers in Minnesota now and they seem to have been successful in persuading the general Minnesota population about the “peacefulness” of Islam. Ilhan misled Minnespta voters about her intentions toward Israel. As Americans vote less, immigrants with an eye toward changing American culture while taking advantage of American wealth, vote more! There is more to the problem that Minnesotans have created for America, though. There were two other factors that affected the outcome in Minnesota. First, Ilhan preyed on Americans’ love for immigrants. Despite the problems at the southern border, Americans support legal immigration and we all know that just a few generations ago our families were immigrants. So, Americans want to extend their welcoming hand. How much better can Americans feel about themselves than to openly accept, and even promote, those who are so much different in ideology, theology, culture and everything else? It just gives us all such a warm, fuzzy feeling, doesn’t it? We can pat our American selves on the back and proclaim how wonderful we are while ignoring our own stupidity. Next, Ilhan made use of an ancient Islamic doctrine of deception, ‘taqqiya’. It is this that has now gotten Americans the situation that exists in the American congress. Watch this report by David Wood. The Ilhan Omar debacle is now taking precious time, energy and resources away from other more important debates and making Americans look bad globally. Congress debates while the world looks on. Here are a few excerpts from the House debate. Keep watching because I will tell you how this all fits into the Great Tribulation picture. The reason you needed to hear Congresswoman Elaine Luria is because she is a Jew facing Ilhan Omar head on in what really is a microcosm of a coming reality between the Jews and Muslims. The first Jewish messiah / Antichrist will face the Muslim messiah / Antichrist in a war that will kill the Jewish messiah / Antichrist. Jews in the American congress are facing what will become a reality on Israeli soil. The debate was over a resolution and not a bill to make a law against the harm of Jews by Muslims. No, instead, Congress added negative speech about any religious group, including Muslims, in the resolution. The hate speech is not against Muslims, but against Jews and Ilhan Omar’s behavior and words are in line with the Islamic agenda to conquer both the United States and Israel. The US must continue to come down on Israel’s side against Islam because the US is more House of Israel – and thus, the sister of the House of Judah – than a relative of Islam, even though many of our Hebrew brethren are trapped in Islam. The United States is the face of the House of Israel, the Ephraimites House, in the end of days who has been captured, once again, by Babylon under Barack Obama. You see? The reason the politicians can’t lead the world out of the coming mess between the three main religions is because they can’t even identify the problem! President Donald Trump is not the problem! But the politicians don’t want to identify the problem because doing so would then require them to repent of their crimes against YHVH, return to His Kingdom and uphold His laws instead of their own. That may seem simplistic to some, but the truth is that Yeshua taught us how simply and well the Kingdom works because there is no politics there. Gone are the Pharisees – modern Rabbis. Gone are the Beast empires – the Roman, Greeks, Persians, Babylonians – end time America. Gone is the idea that individual believers get to make up their own rules, instead of following YHVH’s very simple, life-extending and life-giving rules. The reason our people need those who have the Biblical perspective is because the politicians have no spiritual insights. America is Israel’s sister. America is related to Israel by ideology from the Bible. America is not related to Islam by Ideology. Yes, all three religions share Hebrew descendants from Abraham, but only America and Israel are YHVH’s national descendants both of which have Gentile DNA mixed in with them. It is because of this sister relationship that America must stand with Israel even though Israel is rising to beat America down at some point to enslave those the Jews believe are Gentiles and not even of the same species as themselves. Now I’m going to say something that you may find surprising given the fact that many think I am Antisemitic for calling the Jews to a greater righteousness and cooperation with YHVH to restore His people to their Land. I’m going to tell you why Americans must stand up against Ilhan Omar and all of Islam with Israel. It is because our Biblical nation of Israel – not to be confused with the modern UN-created STATE of Israel – has failed to stand together, to work together, to fulfill the promise of brotherhood towards all twelve tribes together, seeking only what is good for all Hebrews, not just those of our own religion, Christianity or Judaism – House of Israel or House of Judah. I’m talking about the 2,900-year-old split in YHVH’s Kingdom and the civil war between the two Houses that is still ongoing. I’m telling you that it is up to us – you and me – to pray and work for this to stop! In essence, this is what praying for the peace of Jerusalem means. There was no peace in Jerusalem after the split and there won’t be peace in Jerusalem until peace and brotherhood become a reality between the two Houses. YHVH’s Biblical Israel is one of justice and equality, and one that stands against the mutual enemy of any tribe. Ephraim is America, Canada, Europe, Australia, New Zealand, South Africa and all the places where Ephraim “climbed over the wall”. Politicians cannot stop the hatred of Edomite Islam against Israelite Judaism and Christianity. They cannot prevent the rise of the Mahdi against the modern UN-created State of Israel and America. Ilhan Omar is just the beginning because the political knot heads refuse to take a stand against Islam’s agenda. Thus, they are allowing the takeover of America from within ideologically at the same time that she is threatened from without militarily. The danger to America, end times Mystery Babylon headquarters, is clear. She will be punished by both her own sister, Israel, and her Islamic Edomite cousins. It is no wonder the destruction of Mystery Babylon will be so memorable! She will be squeezed between two Antichrists – the Jewish one that rises first, followed by the Islamic one that follows after he kills the Jewish messiah and Antichrist. Will this be the Purim when the Jews introduce their Chabad Cabal Jewish man-messiah to the world? That still remains to be seen. They certainly continue to push for Gentiles to join them. And to this, I want to say that the Jews have never in all their history wanted to have anything to do with any Gentiles. They pushed the House of Israel returnees away when Paul tried to bring some to the Temple before its 70AD destruction (Acts 26). But the Jews sure want the Gentiles now. Why? It is because they intend to force all Gentiles to accept Judaism or Noahidism. Scripture says that Hebrews, Israelites, are not to make a covenant with Gentiles. But the Jews, converting people to Judaism or Noahidism are not violating that command in the strictest sense. They are making those Gentiles as one of them, either as an equal in Judaism or as a slave in Noahidism. 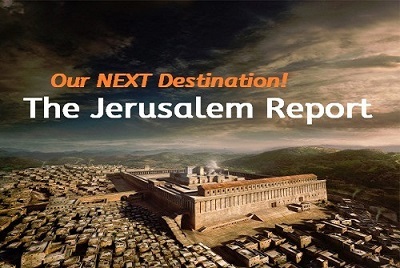 In this article titled, Daily Prayer Book for Non-Jews to Bring in the Redemption by Adam Eliyahu Berkowitz on March 18, 2019, As preparations move forward to build the Third Temple as the House of Prayer for All Nations, rabbis are beginning to cope with the practical issues of what that prayer will be. One rabbi has prepared a prayer book specifically for non-Jews that contains daily prayers as well as for any occasion. The coming Temple will have practical issues that need to be addressed. Issues like, “do they need to be killed for coming into the Temple” or “maybe we should give them a Jewish prayer book so we can increase our ranks for the war to come with Iran”. If you think I’m being facetious, just know I am not! The structure of the prayer book is comprehensive and very close to that of the Jewish Siddur (order), including prayers for regular weekdays, the Sabbath, holidays, and a full Haggadah for the Passover seder ritual. Does this mean the Jews are going to have Gentiles – UNCIRCUMCIZED Gentiles – observing Passover? Well, if the Jews circumcise Gentiles so they can observe Passover, that will mean that the Gentiles are no longer Gentiles, but Hebrews and equal to Jews, according to the Torah. If the Jews would look in their Tanach once in awhile, instead of in the Talmud, they would know this. Do you see how religion blinds us to the truth? There is also a section titled “Gates of Learning” to help clarify the fundamental principles of faith. There is another reason for this Jewish push to convert Gentiles in the millions. They know war with Iran is coming and they know the prophets say that Ephraim will be with them to fight their enemy. They are taking it on themselves to bring about their version of restoration, the version that can’t see beyond Judaism. They don’t yet understand that it will be the Ruach, Yeshua’s Holy Spirit, who will cause the enmity between the House of Judah and the House of Israel to cease. Our enmity won’t cease because they have converted Gentiles to Judaism. “The increase of people observing the Noahide laws is very important in this era,” and “The creation of the State of Israel has made it once again incumbent upon us as Jews to once again act as a light unto the nations,” Rabbi Cherki said. Let’s know this. The House of Judah has never been a light to the nations. It is only since 1948 that they have been allowed to return to YHVH’s Land, but they were brought back to see if they would do better than they did before the Roman and Babylonian exiles. They didn’t do what they should have back then, and they are not doing what they should now. I have criticism for the Jews today, but it is not Antisemitic. It is a call to righteousness, not castigation like Ilhan Omar and other Antisemites. The truth is it scares me for them and at the same angers me for the way they are trying to prevent Yeshua from taking His rightful place. That means the Jews believe YHVH is not our Father. Also, Gentiles will not be permitted to read from the Torah in the presence of Jews. There will be no need for Jews and non-Jews to pray together but neither will it be forbidden. Let’s continue to stand with the Jews even though they are rejecting us. They are our brethren. Because of Yeshua, we are more enlightened than they are, and it is our duty to step into Joseph’s role as leader. In other news, Syrian and Iraqi armed forces have decided to launch a joint operation for reopening the border between Syria and Iraq. A short time earlier, the Assad regime issued a statement demanding that US forces remove themselves from Syria. This was meant to be the lead-in to the reopening of the 615km-long Syrian-Iraqi border to free the movement of goods and people for the first time after five years of closure. By this operation, Iran hopes, once the Russian and US presence is gone, to get started on building its much-coveted land corridor for linking the Persian Gulf to the Mediterranean via Iraq and Syria under Tehran’s control. Russia plans to station the bombers at its Crimea base permanently. Nuclear confrontation takes another uptick; the wire gets tighter.